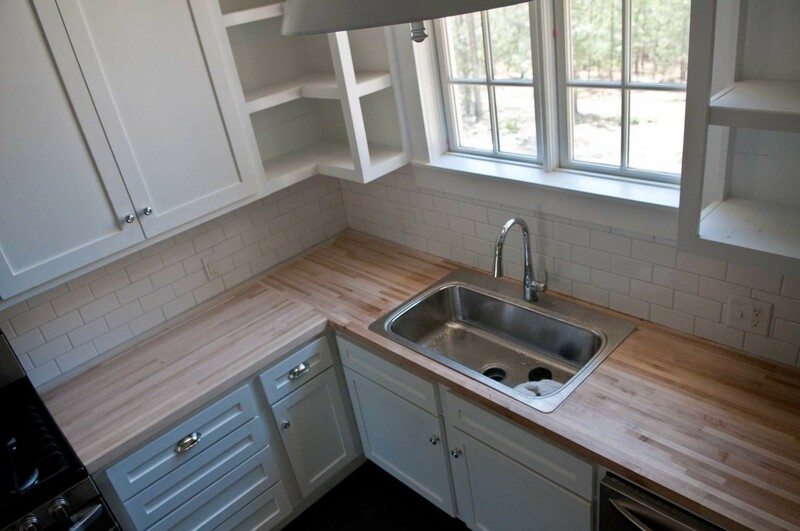 If you are looking for an easy update for your kitchen countertops, take a look at butcher block. It’s a classic choice, both functional and beautiful. Butcher block will fit into any style; it’s all about the wood that you select and the finish. Maple – Maple is the most traditional and what I selected for the Garden Home Challenge house. It’s a popular flooring choice for high traffic areas because it’s durable. The light color is especially nice for bright kitchens. Walnut – American walnut is a blend of dark to light brown and cream. Walnut is beautiful in both traditional and sleek, modern kitchens. Cherry – This is a classic choice for countertops. The red and brown color deepens with age so the material just gets better looking over time. White Oak – White oak has honey tones, open grain and interesting burls. Choose this wood for farm house chic rooms. Butcher block is very forgiving of daily use and with minimal care it will maintain its beauty for years. Keep the wood well-oiled and dry so that your love affair with your countertops will endure. The first thing to do is to condition the wood with food grade mineral oil. Apply a generous coat of mineral oil and allow it to soak in for about 15 minutes. Repeat the process until the wood won’t absorb any more oil. Wipe off the excess. Don’t worry about using too much oil. Avoid edible oils such as vegetable, olive or nut oils. These contain fat that will go rancid over time. Next seal the surface with beeswax, which is safe for using around food. This will keep the oil in and block out moisture and bacteria. Spread on evenly, allow the wax to dry, and then buff with a soft cloth. If you have brand new butcher block, you will need to oil and wax them once a month or so. It will get easier each time you do it. For daily cleaning, sponge it off with soap and warm water. Be sure to dry afterward. You can sanitize butcher block with a weak bleach solution (1 tbsp. bleach to 1 gallon warm water) or vinegar and water followed by an application of mineral oil. Sand away stains, scratches and imperfections with a fine grade sandpaper. I found the butcher block used in the Garden Home Challenge house at Lumber Liquidators. Famous for their flooring, they also carry butcher block countertops. I was able to get a 1 Â½”x 25″ x12 linear foot countertop for $359.00. That’s quite a savings. Check them out at www.LumberLiquidators.com.